ORONO, Maine — It isn’t easy to leave home and move to a foreign country when you’re a teenager. But Riga, Latvia native Eduards Tralmaks received an email from Boston Bandits coach Mark Jones informing him that he was looking for a hockey player for his 16-Under (age) team. So Tralmaks consulted his father. “He told me it was a no-brainer. America is where you want to be,” said Tralmaks, who is currently sharing the team lead in scoring for the University of Maine with seven points on five goals and two assists through UMaine’s first eight games. His five goals are tops on the team and he is tied for third in the country among freshmen in that category. Only Michigan State’s Mitchell Lewandowski and the University of New Hampshire’s Max Gildon have scored more. Each has six goals. Tralmaks had a Latvian friend who played for the Bandits and Jones had asked his friend if he knew of any good players back in Latvia who could help the U-16 team. His friend mentioned his name. So he made the journey to Boston in 2013. “It was one of the most difficult times of my life,” said Tralmaks. “Personally, I wasn’t as independent as I am now. My (English) wasn’t the best. “But I had real good teammates. They made me comfortable with everything so my language got better,” said Tralmaks. “Now this feels more home to me than (Latvia) because I have been here such a long time,” he added. Tralmaks certainly made a smooth transition on the ice. He had 20 goals and 14 assists in just 20 games for the Bandits’ 16-Under team during the 2013-14 season before graduating to the Bandit’s 18-Under team the following year and to their Junior Bandits’ Eastern Hockey League team in 2015-16 where he was named the EHL’s Premier Division Most Valuable Player. He had 28 goals and 27 assists for the Junior Bandits in 40 games that season. Tralmaks, who has played for Latvia in the World Junior Championships, moved on to the Chicago Steel of the United States Hockey League where he tied a playoff record with 10 goals in 14 games in helping lead the Steel to the Clark Cup. He also had two assists. He had 11 goals and 16 assists in 46 games during the regular season but he was slowed by a broken ankle suffered early in the season. He had two goals and an assist in UMaine’s last game, a 6-2 win over defending Hockey East tournament champion UMass Lowell on Nov. 4. That ended UMaine’s 23-game road winless streak (0-19-4). That earned him Hockey East Rookie of the Week honors. 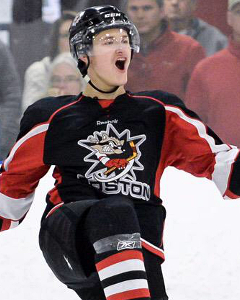 Between his 14 Clark Cup playoff games and his eight games at UMaine, he has scored 15 goals in his last 22 games. Perhaps the best compliment he received was from UMaine sophomore defenseman Patrick Holway who called him a “nuisance” to play against in practice because of his skill and tenacity on the puck. “And he works hard every day. He’s one of the last guys off the ice. Credit to him. He has deserved it,” said Holway. The 20-year-old Tralmaks, who has played primarily right wing but has also seen some duty at left wing, has been pleased with his start and credited his teammates for playing an important role in his success so far. He been on a line with Pearson in seven games and the other wing has either been senior Nolan Vesey or sophomore Mitch Fossier. “I’m just glad to help the team the best I can and, hopefully, we’ll get some more wins,” said Tralmaks. “Scoring five goals in eight games is pretty impressive for any player, especially a freshman,” said UMaine head coach Red Gendron. “He can really shoot the puck and he’s a big strong player with a very good pair of hands. He’s a competitive kid who is also very coachable.